Hello everyone and welcome back to the Armory! During our last visit, we covered close range weapons like SMGs and Shotguns. While these guns are excellent for dealing with Attackers in close quarters combat, what happens if you need to politely defend a long hallway from approaching ARGUS Enforcers? Fear not, for the long-range weapons available to Defenders will allow them to hold their ground efficiently. Today we'll be covering both rifles and sidearms, so read carefully and you might be able to come up with a plan to kill everyone you meet. As before, these weapons are still in active development, so animations, sounds, and balancing are all liable to change. The pre-round firing range has gotten a bit of an upgrade! The target dummies you can shoot at now change color based on the amount of damage taken, displayed in 25 damage increments and account for things like bullet type, headshot damage, and bullet penetration. Red is equal to 100 damage taken, which is the equivalent of a full-health Defender. If a target section is destroyed, this is equal to 200 damage, which is overkill to say the least. These updates should make it easier for players to determine the effectiveness of each weapon. Targets are placed at various distances in the gun range for training purposes and include a “reset button” to revert the target back to its original state. The gun range also includes a bullet penetration section that has special glass of varying thicknesses to give players an idea of how much damage weapons do when firing through objects. This target is featured in the videos below, so let’s take take a look at Defender Long-Range Weapons! The F1-Legros may be a relic, but it will reliably stop Enforcers in their tracks. Despite the rustic look, the Legros is still a force to be reckoned with. Shooting heavy WW1 era slugs, the F1 will destroy Enforcer's body armor on impact, rendering them vulnerable to further damage and slowing their advance. While it hits like a ton of bricks, the Legros's painfully slow cyclic rate of 230 RPM and high vertical recoil make followups very difficult. Its small rotary clip takes forever to reload, so the weapon is best used at standoff range in a supporting role. You'll be fighting its recoil more than you'll be fighting the enemy, but if you hit center of mass you'll be a credit to your team. This weapon should be immediately familiar to those who have kept up with past blog posts. While similar to its close ranged sibling, the KR82 sports a rear stock and sight post that allow it to effectively engage targets at a distance with fully automatic fire. Its highly damaging rounds pierce thick objects and enemies alike, which makes this weapon as versatile as it is deadly. The only true assault rifle, mastering the KR82's strong recoil pattern will grant its wielder excellent firepower at any range. The Ingmar 57 finds its claim to fame as one of the few Defender weapons with a scope. The Ingmar is strictly a ranged fighter, as its small sight picture and low magazine capacity makes engaging multiple targets difficult. It's a solid block of steel, and its magazines are heavy, which makes relocating it in the heat of battle quite hard. On the flip side, that weight, combined with its slow cyclic rate of 420 RPM, makes it easy to control recoil and walk in multiple headshots at range. An Ingmar in the right place can be devastating. The "ol' reliable" of sidearms, the GAT-9 finds its place as the Defender's go-to holdout weapon. While it may not have the greatest damage in the world, this pistol fires blisteringly fast--as quickly as you can pull the trigger. A 20 round capacity magazine means you'll have ammo to spare, which makes it a great weapon to shoot out lights before the action starts. Whether you're saving it as your last resort or drawing it when reloading your primary weapon is inopportune, the GAT-9 will be there for you in your time of need. When facing a wounded ARGUS Enforcer, and the GAT-9 just doesn't pack the punch you need, look no further than the LS45. While ineffective against undamaged armor, this bad boy can quickly take out an unwitting adversary with a bullet or two to the head. With its high recoil and measly 7 round magazine, the LS45 is the natural choice for the crack-shot who can confidently pull of head shots in the heat of battle. Since we're covering weapons, I suppose we might as well include a related bug. This week: When recoil goes too far. That's it for this trip to the Armory, which means we've now covered all standard weapons currently available to Defenders. Teams will have to choose which weapons to bring to each round based on level layout, personal preference, and enemy plan expectations. We have plenty of ideas for future weapons, specifically for additional sidearms like miniature shotguns or machine pistols. Next time on the Armory we'll take a look at Attacker Weaponry. Until then, feel free to hit us up on either Discord or our Subreddit! 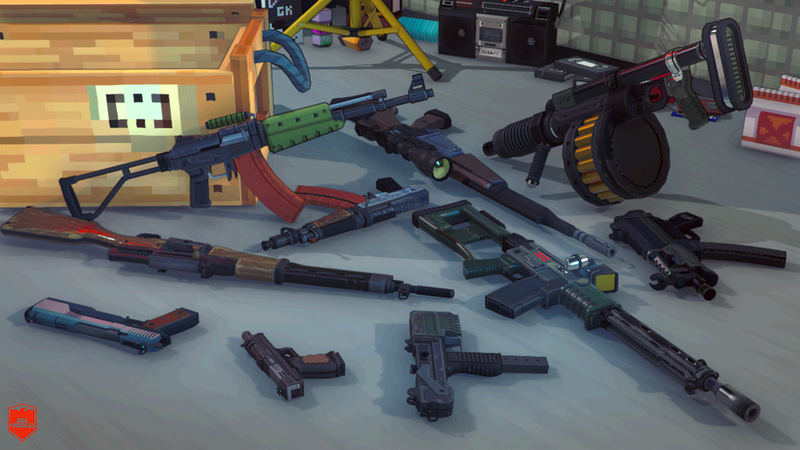 While creating the thumbnails for this post, /u/Lt_Commander put together a compilation image of all Defender Weaponry, which we thought made excellent background fodder. Enjoy!